HOME > SPORTS > NBA Trade Rumors: Kristaps Porzingis And DeMarcus Cousins In Bill Simmons’ Three-Way Trade Proposal; Who Says No: Knicks, Kings Or Celtics? NBA Trade Rumors: Kristaps Porzingis And DeMarcus Cousins In Bill Simmons’ Three-Way Trade Proposal; Who Says No: Knicks, Kings Or Celtics? The turmoil at Sacramento guarantees that DeMarcus Cousins will always be at the center of NBA trade rumors. Despite his issues, he is definitely a top 10 talent and any team willing to take a challenge of coaching him should definitely take a shot. Bill Simmons aka The Sports Guy who used to be with ESPN and Grantland, now with HBO, was always a stalwart for DeMarcus Cousins going to the Boston Celtics. However, he recently tweeted a different scenario. 3-way deal: Boogie to the Knicks, Porzingis to Boston, Lopez plus Boston's unprotected Brooklyn 2016 pick to Sacramento... WHO SAYS NO? The basis for his proposal is that the New York Knicks do not have the time to develop Kristaps Porzingis. As stated in this article by CBS Ken Berger, Carmelo Anthony does not have time (and enough prime years) to wait until Porzingis becomes good enough as a second star on the team. While Knicks president Phil Jackson continues to preach patience, Anthony is on the wrong side of 30 and his personal championship window is closing. It could be argued that the Knicks are simply just amassing assets that could be desirable enough to translate into a marquee player trade-which is why they took the gamble-and won, on Porzingis. For the Celtics, some fans are hesitant over acquiring DeMarcus Cousins directly because of the fit, as this report from The Boston Herald suggested. Coach Brad Stevens is a former college coach, and he has yet to coach anyone being close to the inflated ego of DeMarcus Cousins, who has been treated royally by the Kings. The challenge of DeMarcus Cousins can be handled by the Zen Master, even with Derek Fisher coaching. Also, the Celtics, with coach Stevens would provide the best environment for the Porzingis develop his full potential. 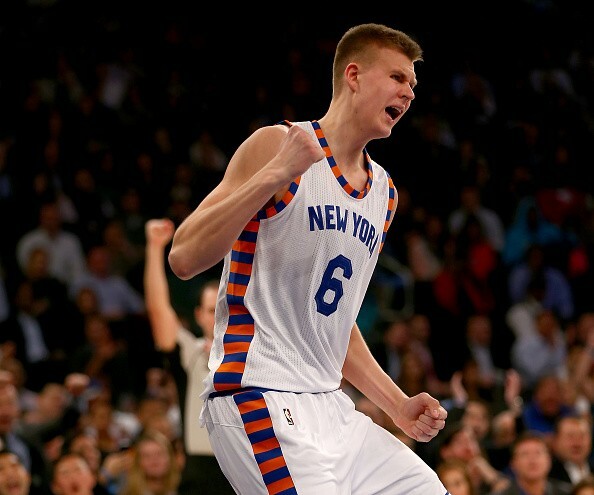 Would the Celtics be fine with trading the Brooklyn Nets pick for Porzingis? The Nets pick is overrated at this point. There is no assurance where it lands, and even if it's no.1, which player from the 2016 NBA Draft would be better than what Porzingis is turning into? The Kings will have a starting center (Robin Lopez) and a possible lottery pick and be free of the issues brought about by Cousins. What do you think of this trade? Interesting, unlikely or outright ridiculous? Which team would say "No?"